Freedom Fighters are engaged in a fight to the death. They cannot lose. Torture and death await their capitulation. They will win or they will die. That’s the mentality that drives them to face tanks, helicopters andÂ artilleryÂ fire with handguns, machetes and household tools. That’s the determination that has driven back tank assaults in the streets of Zawiya. Idealistic? Realistic? Who am I to judge? I don’t know where they find their courage. I am thankful my son has not been driven to these acts of desperation. But I am as proud of them as if they were my own sons. I feel with their mothers the pain and agony – and pride. They are truly Lions of the Desert. But we don’t want to see them all die. If the West doesn’t stop the tanks and the planes, the bloodbath will be greater than we can imagine. They will not give up. And they shouldn’t. Free Libya! Failure is not an option. 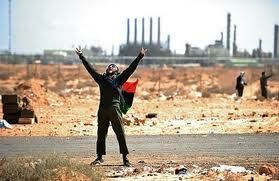 The people of Lybia have awaken to have freedom. They are ready and willing to die. So, when determination is strong and unwavering, nothing will stop them. Their desire will be full-filled and it is a matter of time. If the world is serious, they should support the freedom movement in Lybia, help people with arms, work with the provisional government, recognize the government, outlaw khadafi’s dictatorship, bring all pople involved in killing to justice, impose no flyzone, place travel ban on killers and capture them, no assylum for them, take every penny from them and give it to the people of Lybia. May God- Almighty give the Frredom Fighter the strengh, courage and long-lasting energy, sustained determination, unity, selflessness and wisdom.